We offer this service for local city usages. You can avail this service at any time you wish to through online website of our services. The Local Full Day service will be available for a variety of local trips including sightseeing, shopping, attending meetings, seminars, visiting hospitals, and a lot more. The service is designed precisely for travellers looking for pickups and drops facility from one destination to the other. 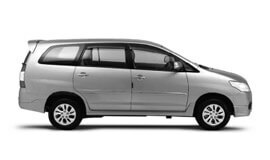 We include airport pickups and drops, hotels pickups and drops, railway station pickups and drops, and bus stand pickups and drops under this category. Our trained chauffeurs will reach the appointed destination on time. These trips are devised to cater to your interests and needs prior to arranging for a package. We also arrange for group packages from Vadodara to places nearby. The cars sent across will accommodate group size to ensure maximum convenience. The to and fro service in Vadodara is available for multiple destinations from Vadodara. The one way service is ideal for those who need one way drop to their destinations from Vadodara. The package is designed for those visiting multiple cities within a fixed period of time. The packages listed above are designed keeping in mind specific requirements of Vadodara travellers. We also offer special Vadodara city sightseeing tours and any other customized cab rental packages. At My Taxi India, we guarantee the best car rental services in Vadodara at highly affordable prices. The weather of Vadodara is dry in nature. The climate is hot between the months of March and July. During November to February, the climate is marked by a dry weather. Residents and tourists will experience a mild chill due to cold northerly winds in the month of January. From mid-June to mid-September; the city experiences monsoon season making the environment humid. According to official Census of 2011, Vadodara had population of 4,165,626. The discovery of oil and gas in Ankleshwar facilitated industrial development of Gujarat. The refinery is a basic industry that made vital contributions to the city both at the regional and national levels. Some of the large-scale industries in Gujarat include Gujarat State Fertilizers & Chemicals (GSFC), Indian Petrochemicals Corporation Limited, Gujarat Alkalies and Chemicals Limited Heavy Water Project, Gujarat Industries Power Company Limited (GIPCL), Oil and Natural Gas Corporation (ONGC) & Gas Authority of India Limited (GAIL). Presently, Vadodara is a hub for IT in Gujarat. Vadodara also houses the Vadodara Stock Exchange (VSE). A tour to Vadodara will make for the most relaxing experience for the entire family. Vadodara is a cultured, harmonious university town. It is about 100 km southeast of Ahmedabad. The town is popular for its colourful events and joi-de-vivre during festival season. When in town, one can enjoy impressive museums, Indo-Saracenic palace and exquisite Tambekar Wada. Many tourists visit the place for magnificent Unesco World Heritage site Champaner. It is also home to two beautiful mosques lost in the landscape.